Eduardo signing copies of “Humans on Trial” at the Madrid Book Fair. Eduardo has written 15 books published in over 20 countries, including the US, the UK, Spain, Germany, France, Italy, Norway, China, Japan and Korea. 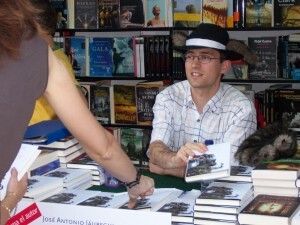 Humans on Trial is a novel by Jose Antonio Jáuregui which Eduardo edited and completed when his father passed away before the manuscript was finished. Conversations with my Cat was his first solo work of fiction, published in Spain by Ediciones B (2013). It is a fable about human happiness from the point of view of cats. Rights have been sold to over 10 countries. Sicilian Yoga is his second novel, also published by Ediciones B (2015), with rights sold to France and Bulgaria. He has also co-authored the autobiography of the Beatles’ hairdresser, Leslie Cavendish, and written three psychology monographs on the topic of laughter and humour. In the past few years, Eduardo has concentrated mainly on middle-grade and young adult fiction, writing the children’s book series The Most Wonderful Story Ever Written and the non-fiction 50 Secret Missions to Help You Survive in the World of Grownups. He works for Disney, Salani and other international clients through Book on a Tree, a storytelling agency founded by bestselling children’s author Pierdomenico Baccalario. 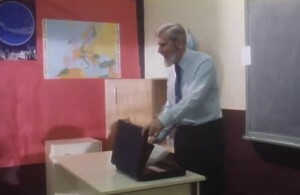 Black or White (co-written by Eduardo), a suspense-comedy short film about a student who tries to cheat during an exam, received the Premio Goya (Spanish Academy Award) for Best Short Film in 1991, and was selected for the London Film Festival in 1990. Centralman (written and co-directed by Eduardo), a web series for an advertising campaign (whose creative director was also Eduardo) received three awards, including Best Campaign, at the Smile Festival, the European Festival of Humor and Advertising. Since Eduardo began adapting Monty Python sketches for the stage in his school days, he has always loved the theatre (and particularly, comedy). Absurdia Teatro. Eduardo was one of the founding partners of this improv theatre company, performing in improvised shows such as El Club de la Impro, Duelos de Impro or Circus. He has also participated in the production of improvised performances for corporate clients such as BASF and the Madrid City Hall. He is a member of the Applied Improvisation Network. Fun at Work Day. 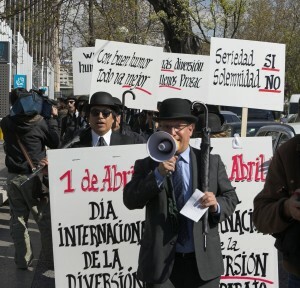 Every year, Eduardo designs, directs, and performs together with his partner at Serious Fun Jesús Damián Fernández, in a semi-improvised street performance to promote “Fun at Work Day”. These performances have been featured widely in Spanish news media: on all major TV newscasts, newspapers, and primetime radio and TV shows. Presentation of Humans on Trial. 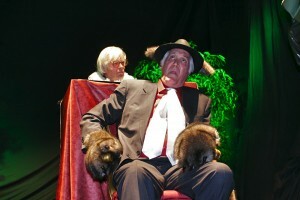 The original Spanish edition of Humans on Trial (see above) was presented at Palacio Gaviria in Madrid, and a chapter from the book was enacted on the stage: the interrogation of Branco the Wolf. This short play included the participation of Federico Luppi, one of the most admired actors in the Spanish-speaking world, as well as the film director Antonio Mercero. Eduardo adapted the text for the stage and directed the actors. Juicio a los humanos by Onira Teatro. Eduardo participated, together with José Piris (director) and the four actresses involved, in adapting the text for this professional theatrical version of Humans on Trial, which has played all over Spain. He also sat in at many rehearsals to provide his perspective on the performance. Un viaje por España. Eduardo wrote and directed this dramatized concert for the Aglaia Trio. It deals with the cultural and linguistic diversity of Spain, with the expulsion of Jews by the Catholic Kings in 1492 as its starting point. The work premiered in May 2016 at the Paco de Lucía auditorium of Alcobendas, Madrid. Creative director of the ad campaign Centralman, el defensor del viajero (2010-2011), for Centraldereservas.com, a campaign which received three awards (Best Campaign, Best Interactive Campaign, Best Website) at the Smile Festival, the European Festival of Humour and Advertising. Information architect on large corporate websites and e-commerce sites for web consultants Scient (London, 2000-2001) and Netjuice Network (Madrid, 2000), during the dotcom “boom”. Advertising copywriter for the marketing deparment of Spanish retail giant El Corte Inglés, writing copy for radio and press ads, catalogues and in-store announcements (summers 1991-94).